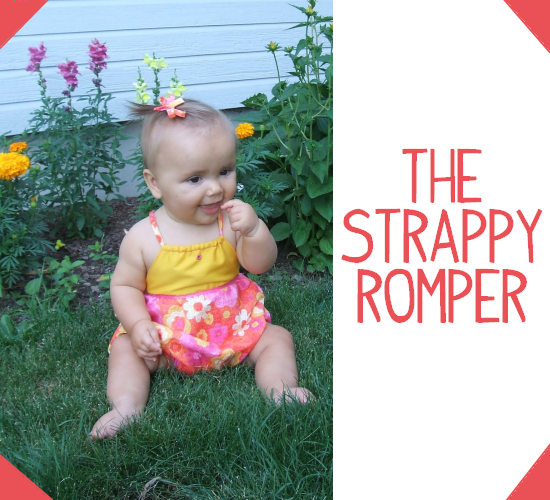 Strappy Romper Free Sewing Tutorial - Peek-a-Boo Pages - Patterns, Fabric & More! This is my first tutorial- sooo exciting! Hopefully you will all enjoy making cute things as much as I have. Just leave a comment if you get stuck and hopefully I can clarify. You can find this and all future tutorials under the tutorial tab at the top of the page. happy sewing! 2. Sew the yoke together along the neckline. Press the edges inward. 3. Fold the yoke in half wrong sides together and then topstitch along the edges and across the neckline. Make sure you leave some space along the neckline for your drawstring and leave the bottom open. 4. Gather the top of the front bottom piece so that it matches up with your yoke. (Never gathered? It’s easy- just put in a row of basting stitches and then pull on the loose string ends and the fabric will gather right up). 5. Pin the yoke to the bottom front piece right sides together. Make sure you only pin the outer half of the yoke- not the liner. Stitch it down making sure to not catch the liner. 6. Okay now for the back piece. Measure your baby around the chest and measure the front half of the romper. Cut your elastic piece so that it’s length + the front half of the romper will fit around your baby. Fold the top of the romper over to the backside and stitch the elastic right on top with a zig zag stitch. The fabric will gather as you go. Make sure you stretch the elastic all the way to the end- you may want to tack it in place or pin it down before you start. The elastic will cover up the raw edge of your romper and do all of the gathering for you- nifty right?! 8. To finish the edges in the front fold the bottom edge of the yoke lining up and in so that it covers the edge of your gathered piece (the pic. is showing you the view from the inside). Now flip it over and topstitch along the bottom edge of the yoke. OR you can handstitch it down if you’re more comfortable with that option. 9. At this point you may want to try it on. Measure around your baby’s neck and down the back of the romper to see how long to make your strap. Mine is 24″. Make sure you leave some extra room for the strap to mke a little “x” in the back. See what I mean? Ok- to make the strap I used a 1×24″ piece of fabric. Fold it in half right sides together and stitch along the side and across one end. Trim your edges and then turn it right side out. The trick to this is to use a tiny crochet hook, pencil, etc. Take the end you stitched shut and shove it into the tube with your crochet hook. Keep on pushing and before you know it the whole thing will be right side out. (sorry about the terrible pic. but it should give you the basic idea). To make the legs fold over the bottom twice to make a nice clean edge and then topstitch it leaving enough room to thread some elastic through. Make sure you leave an opening at the end to get the elastic in. Do that for each leg and thread your elastic through (I use a safety pin) and then stitch the opening closed while tacking down the end of the elastic. 11. Don’t worry- you’re almost there. Cut a strip of fabric about 1″ tall and about 1/2″ longer on each side of the section where the snaps will go. Fold the short ends in towards the wrong side of the fabric and stitch them down. Pin your fabric right sides together and stitch together. 12. Fold your little snap section over twice, so that you have a finished edge and it’s in place on the wrong side of the romper. Top stitch it down leaving enough room for some snaps. 13. Add your snaps and you’re done- hooray!